Wow conference was just so great! I can't believe it has almost been a week since the square was flooded with people. It is true the saying "The days move slow, the weeks move fast, the months move faster and years don't really happen" (okay I made most of that up, but you get my point). I got to see quite a few return missionary friends and hear about their new life adventures. They actually answer quite a few of my questions that I had brought to conference. I know as I study the other general conference talks my other questions will be answered. I have been coming to the square for personal study and companion study and reading the general conference talks, they are truly answer all the questions I have. My favorite at the moment is "approaching the throne of God in confidence". As I listen to his first opening statements, questioning us on how we would feel if we were about to meet our God. I stoped and wrote down my feelings and than continued. He gives us 6 points to work on to help us become more confident for that day when we do have to approach the throne of God. I was delighted to read about how the atonement was key in helping us have confidence, my favorite line "Because the Atonement of Jesus Christ is very practical, you should apply it generously 24/7, for it never runs out.". It never runs out. Shouldn't that be music to our ears? I just feel so much gratitude for my Savior and the opportunity I have to repent every week as I get to partake of the sacrament. That I can have confidence when I see my Father again. The Saviors sacrifice just means so much more to me now. So many people talk about how members of the church have a light about us. I think this light an confidence comes directly from our knowledge of the atonement of Jesus Christ. Knowing that as we do our best, the Savior takes care of the rest. I can't imagine not having this knowledge... this is why people get discouraged in life. The knowledge we have... knowledge of what this life is all about, really take the temporal stress away, and leaves only the spiritual stress to put those important things first. Prayers, scriptures reading, temple work, church attendance, home teaching, visiting teaching etc these are the important things that help us be better and that is what we are going to score the highest on when our mortal life is all added up. Okay I will be off my soap box for now. I love you all and hope you have a great week. Its your choice to follow our Savior. Its your choice to study these things out. But I know these thing are true and they will stand as a witness forever. Mom note: I was on business in SLC. 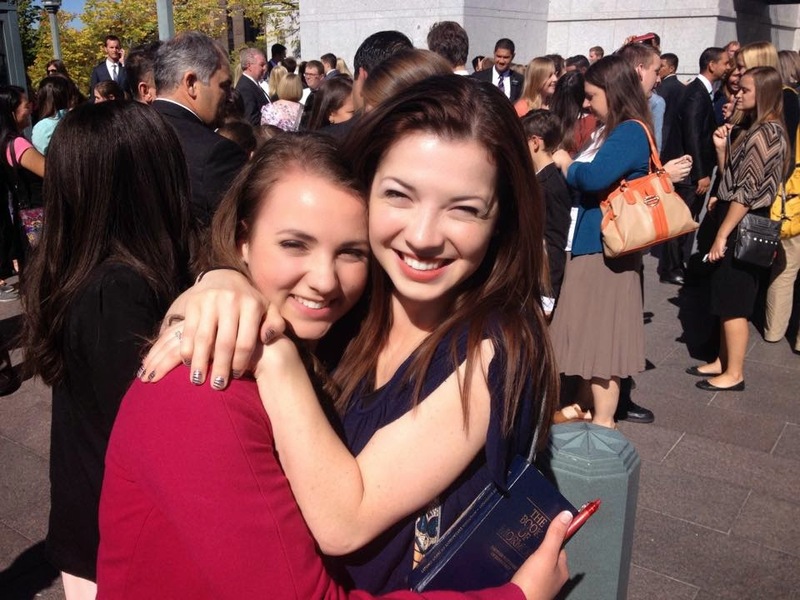 (The sisters on Temple Square are allowed to have one visit with their family.) 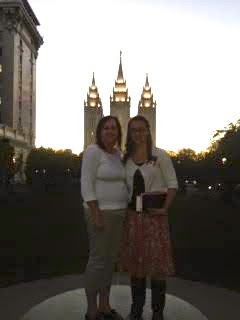 I surprised Lani and showed up on Temple Square and was able to spend a couple of hours with her. We went out for dinner and she gave me a tour of the visitors centre. (There may have been some tears spilt from both of us.) I got enough hugs to last me two weeks until we return to get reclaim her.